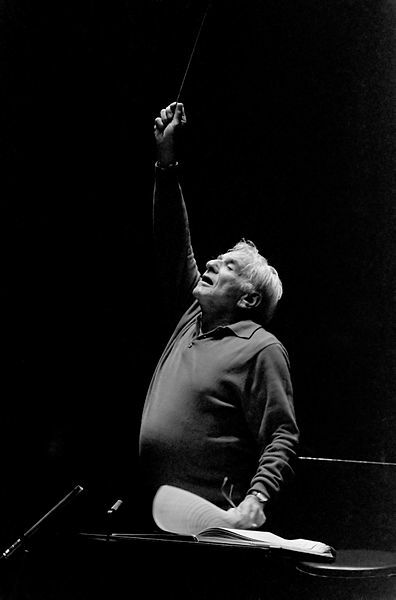 Born on August 25, 1918, Leonard Bernstein was a uniquely and monstrously talented American composer, pianist, conductor, writer and music lecturer. He conducted leading orchestras, most notably the New York Philharmonic. His music spanned multiple genres—sometimes in the same work. I consider West Side Story and Candide to be masterpieces, each utilizing the American musical theater form, but requiring classically-trained voices. His plentiful eclectic compositions include Peter Pan, Wonderful Town, On the Town, On the Waterfront, a Mass, Chichester Psalms, three symphonies, a ballet, an opera, film scores, choral works, chamber music and more. He was also a compelling music lecturer; his famed Harvard lectures can still be found on YouTube. He won 15 Grammys and was venerated by colleagues, musicians and the public. EGMP’s Something’s Coming! The Songs of Leonard Bernstein concert presents vocal works of Bernstein, including those from West Side Story, Candide, On the Town, Peter Pan, Wonderful Town and more. Artists of the highest caliber will offer solos, duets and ensembles in honor of Lenny. For more information, please email Elena Greco. For more information about the Concerts for Healing™ concert series and the performers, click here: CONCERTS FOR HEALING™. Please note: This is a FRAGRANCE-FREE event so that those who have allergies and asthma can be comfortable.